Ventotene is one of the Pontine Islands of Italy, within the Lazio region in the Tyrrhenian Sea, found just off the coast of Campania. Measuring just three kilometres long and eight hundred metres wide, it’s only one of two inhabited islands in the archipelago. Deriving from the Italian word for ‘wind’, owing to the prevailing gusts, the ancient Romans used Ventotene as a prison island, with Emperor Augustus banishing his daughter here in 2BC in reaction to her excessive adultery. And during the Second World War, it contained a German garrison which became liberated without a shot being fired. Today, with a humble population of 700, Ventotene is purely an attractive holiday island oozing an authentic Italian charm and remote feel. Engulfed by tourists during the peak season, Ventotene’s key sights include its fascinating Roman ruins and architectural feats. Most impressive of all is the extensive network of water systems which was dug out of the tufa rock during the imperial period, due to the lack of fresh water springs, in order to catch and save rainwater and channel it around the entire island, built close to the old port. Moreover, in 2009, five ancient Roman ships were discovered resting on the surrounding seabed, with some of the recovered objects now featured inside the Archaeological Museum. Villa Giulia, the residence of Augustus’ banished daughter, sits on the headland of Punta Eolo on the island’s very northern tip. Defined by low-standing walls, enchanting fragments of mosaics, painted murals and ruined baths, the structure is best enjoyed on a guided tour when you can truly appreciate its former magnificence. 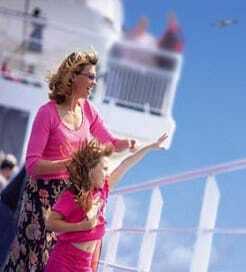 Accessible from many locations, sailing to Ventotene by ferry is quick and easy. 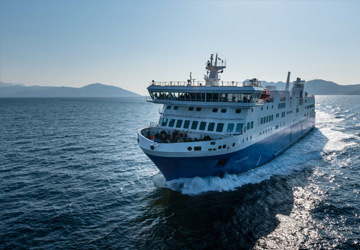 Whether you’re travelling from the mainland; either Naples or Formia, or the neighbouring islands of Ponza and Ischia, you can choose from a selection of the country’s largest ferry operators providing regular routes all week to Ventotene’s port on the northeast coast.